« The GVHBA Spring 2010 Open House Showcase of New Homes for Sale (May 13th – 16th) – Brought to you by the Greater Vancouver Home Builders’ Association – 22 Communities & 50 Display Homes from 16 Local Developers! You know what you want! To be away from it all, yet close to everything, Magnum Projects presents the new Langley condos for sale at Suede Chic Urban Homes project by Redekop (Langley) Homes Ltd. Is that too much to ask? We think not. Introducing the new Langley Suede Condos for sale that feature one bedroom to two bed plus den urban chic homes for sale in the centre of the Langley real estate market place. Coming soon! Call 1.888.893.4242 to register or visit their marketing website at www.suedeliving.ca for all the details. Thank you for registering and expressing your interest in Suede Langley homes for sale. 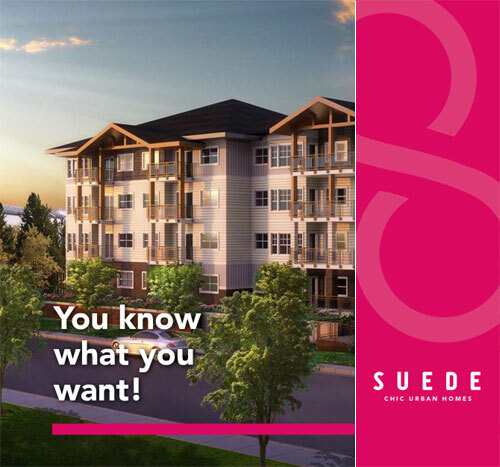 Ideally located within the centre of Langley real estate market, homes at Suede Condos are away from it all, yet close to everything. Suede Langley condos is a collection of chic urban homes, ranging from one bedroom to two bedrooms with den. The Langley Suede Presentation Centre is currently under construction and will be complete for our Grand Opening this Spring 2010. As a priority registrant, you will receive the latest information about the pre-construction Langley Suede Homes presales as it becomes available, and you will be invited to be one of the first to view what Suede Homes has to offer. We look forward to speaking with you soon, and thank you for registering. Sincerely, Suede Langley Homes Sales Team at 1-888-893-4242 or info@suedeliving.ca. Coming soon according the the Vancouver New Homebuyers Guide, the Suede Langley condominiums features a fine collection of spacious one bedroom to two bedroom and den condos for sale that will be located within the heart of the Langley real estate market palce close to restaurants, amenities, services and shopping. The low-rise Langley Suede Condos for sale will offer contemporary, modern, and high style interiors that you would see in yaletown plus a serious space to live it up when the mood strikes or take it down a notch and just relax with friends and entertaining family. More information will be coming soon regarding the new Suede Langley condo development, so please register online at suedeliving.ca today or call to pre-register for the VIP launch coming Spring 2010. The initia price point of these chic urban homes at Suede Langley condos for sale are one bedroom suites from $149,900 and two bed layouts from $229,900, making them the most affordable Langley condo development in the city! Suede Langley Condo Grand Opening! Time: 12pm-5pm, refreshments and snacks on us! Visit: suedeliving.ca or find us on Facebook! Affordable pricing does not necessarily mean that the interior finishings are not high-end. On the contrary, you can have both affordable Langley condo pricing as well as the best finishes and features here at the new Langley Suede Condos for sale. From open flowing kitchens with stainless steel appliances and wood laminate flooring to granite countertops and highly designer cabinetry throughout, the new Langley Suede condos for sale feature impressively designed and decked out interiors that are not found at these price points anywhere else in the Lower Mainland. In addition, the new Langley Suede condominiums will have fine fixtures by kohler, undermount sinks, spacious floor plans and bright living areas. The grand interiors of the Langley Suede condominiums maximize your living space for added comfort and there are two optional colour schemes for homebuyers to choose. The euro style wide plank laminate hardwood floors to the quality carpeting in the bedrooms are very high end and the over height nine foot ceilings are awesome. Every home has a stacked washer dryer and also vaulted ceilings in select floor plans on the penthouse level. The new Langley Suede condominiums also have raised baseboards and door casings. The gourmet style kitchens at Suede Langley condominiums features double square edge 1.50” polished granite counters, designer cabinetry throughout with stainless steel hardware, ceramic subway tiled back splashes and an entire Energy Star rated stainless steel appliance package. Where else would you find this incredible value in the new Langley real estate market place? All homes at the Langley Suede condominium building will also come with pre-wired security systems, additional storage, Rain Screen technology for the envelope of the building and enterphone with camera and security card reader. Underground parking is convenient and all homes will have the Travelers Guarantee Company of Canada home warranty. The bathrooms at the new Langley Suede condos for sale will feature a Grohe Concetto faucet mounted on a Zen Collection Basin, large deep soaker tub with oversized ceramic tiled surround, large format ceramic tiled floors, designer cabinetry with stainless steel hardware as well as double square edged polished granite counters and these are all standard! These affordable Langley condos at Suede Living won’t last long! Luxurious spaces are enhanced by the spaciousness of the rooms and bright and lofty nine foot ceilings. The Langley Suede apartment floor plans feature oversized balconies and outdoor living spaces to extend beyond your living spaces indoors. Plan B at Suede Langley condos is a one bedroom layout between 580 – 620 square feet and features a tub/shower combo, single vanity, washer/dryer laundry closet and a U shaped kitchen. The Suede Floor Plan F is more spacious at 765 square feet and features a one bedroom and den layout. The two bedroom Plan A at Suede Langly pre-construction condos for sale features 855 to 895 square feet of inside living space with a large patio. Last but not least is the largest of the featured pre-construction Langley Suede Floor Plans which is ‘D’ and is between 895 to 1030 square feet in size with a very large walk in closet for the master bedroom and tonnes of storage space. There is also a fireplace in the living area. All Suede Floor Plans are available for download online. The grand opening weekend at Suede Langley condo living will provide a better sense of the offerings at this affordable Langley real esate development property and will features one bedroom floor plans from the mid one hundred thousand dollar range as well as two bed floorplans from the low two hundred thousand range. This is the first release at the pre-construction Langley Suede condos and are featured at unprecedented prices. Only $5,000 will get you started. Your search for the perfect home has ended in the Langley real estat market. Great prices and an even better solid investment along with incredible quality and chic urban styling is now available at the Suede Langley condominiums for sale. Lots to do within walking distance of the new condo development at Suede Langley real estate district is key to the success of this awesome project. From beautiful parks and green spaces to recreational facilities and gyms, the new Langley Suede real estate project is centrally located to everything you want. You have access to highways and major transportation hubs nearby in addition to golf courses, shops, the historic downtown area, and Willowbrook Mall. In addition, the new Langley Suede real estate development features a close proximity to Starbucks, Winners, Save-On-Foods, Chapters and other big box retailers. Also nearby the Suede Condos in the Langley real estate market place are Valley Centre Strip Mall, Langley Centre I and II, and Fraser Crossing in addition to two schools that include Kwantlen Polytechnic University and Blacklock Fine Arts Elementary. The parks close to the new Suede Condos include City Park, Hi-Knoll Park, Linwood Park, Douglas Park and Nicomekl Park to name a few. Some of the community highlights of this Langley real estate district include Al Anderson Memorial Pool, Langley Chamber of Commerce, Douglas Recreation Centre, Coast Hotel & Convention Centre, Cascades Casino as well as the Langley City Hall & Library. Again, the new Suede Langley apartments for sale are brought to you by RKDI developers who have more than 25 years of building experience and present the 2-5-10 year home warranty to all new homebuyers. The presentation centre is located at Unit 104 – 20238 Fraser Highway, Langley, BC and you can call 604.514.1530 today for more information or to pre-register. To read more about the new Suede Langley real estate condo project, please visit www.suedeliving.ca.